So make sure to bookmark this spot and come back between 10 PM and 11 PM ET for our Bates Motel recap. 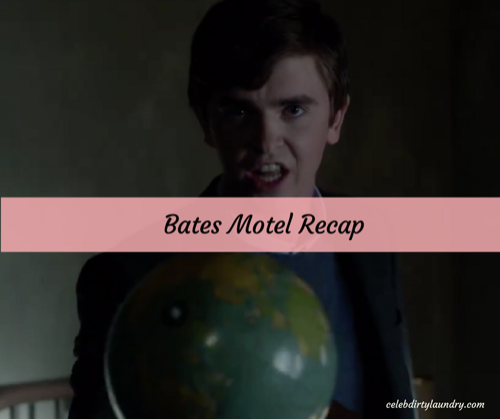 While you wait for the recap make sure to check all our Bates Motel news, pics, videos, spoilers, recaps & more, right here! Tonight’s Bates Motel recap begins now – Refresh Page often to get the most current updates! Bates Motel begins tonight with Chick (Ryan Hurst) confirming that Caleb (Kenny Johnson) is dead after Norma Louise (Ver Farmiga) chased him with a gun into the middle of the road. She orders Norman (Freddie Highmore) and Chick to bury the body. Norman wants to call the police because he feels it’s an accident. Chick reminds him that there are other things in the basement that could cause a lot of police questioning; Norma and Chick convince him to bury Caleb. Chick hands Norman the groceries telling him to leave the chicken as he will make it for dinner. Sheriff Alex Romero (Nestr Carbonell) is dealing with the teen who shot him. He promises not to say a work as long as he goes in and finds a first-aid kit to help him; as the teen goes inside, Romero runs away through the field. The following morning, Chick dresses Caleb’s body, similar to the Pagan/Viking death trip to Valhalla, lighting his body and boat on fire, floating across the water. Sheriff Jane Greene (Brooke Smith) gets a call from the DA. Norman is packing up Norma’s dresses, as he bickers with his mother. He is angry that Caleb was killed instead of being free, he doesn’t like having to bury bodies nor chain people in his basement or dump bodies into lakes. He questions her friendship with Chick; she taunts him about throwing out all her clothes because she will just go online and order a bunch of new ones because dead or alive she can’t prance around the house naked. She leaves Norman holding a box full of her old things, as the doorbell rings. Norman opens the door to the new Sheriff, who asks him about Jim Blackwell, someone who has skipped out on his parole and Norman’s address was found at his place; Norman denies knowing him. She then tells him the only reason she is concerned is because he was recently released from the same prison Romero was in. He then learns that Romero has escaped prison as well, Norman shares his feelings on Romero but the Sheriff finds it awfully convenient and odd that a man who would be out of prison in 2 years would chose to escape implying there is something worth it out there, possibly in his house. She observes his contradiction about the stuff but leaves telling him to call her if someone shows up; he asks the same of her about Romero. Norman goes back inside and tells his mother it was the new sheriff; that she was asking about Jim Blackwell because he had the motel address with his things. He says this is why he is upset, that she always thinks things are best without consenting with him. She says she will wait until he is out of his next blackout before they decide anything. Norman doesn’t tell her that she shared information about an escaped Romero. Norman drops his mother’s stuff in the donation box outside a local church; afterwards he sees Madeleine Loomis (Isabelle McNally) at the hardware store, where he offers her some of his dead mother’s dresses, saying his mom was youthful, fun and vibrant. She promises to go through them and will take really good care of them. Norman observes a moment of Madeleine holding a customer’s baby and he laughs about it. When Norman returns home, he finds Chick who brought some of his things, asking if he can stay in Dylan’s (Max Thierot) old room. Norman stops him saying he feels Chick shouldn’t spend so much time there with him and his mother. Chick promises to help Norman out with everything and his mother likes him; Norman appreciates it but says they can’t see each other every day and Chick can’t live there. Chick angrily leaves as Norman stands there watching him go. Romero finds a small apartment complex and uses a payphone calling 9-11 saying his neighbor overdosed and it in apartment 221. When the ambulance goes up to the apartment, Romero jumps into the rig and steals the medical equipment he needs to fix his shotgun wound, and steals some money. Just as Norman closes the Motel office, the sheriff returns to see him. She wanted to know if the motel keeps an old guest registry, asking if she can see it. She thinks maybe Jim Blackwell checked in possibly under a false name; she jokes a lot of police work is silly until you find what you’re looking for then its not so silly. Norman slips up mentioning that Blackwell lived in Canyon City, and the sheriff catches it. He attempts to cover but she is suspicious and asks if he has seen an early 90s silver and black Lincoln, saying that was what he was driving and gives him the plate number in case he sees it. Norman comes home, flustered about the sheriff’s visit. He demands to know where in the woods she hid the car. He says they are going to the car to move it somewhere further from them. She reveals that she removed the plates, scratched off the VINs and covered it in brush; when they find it Norman says they need to move it and Norma says he is overreacting. They argue because Norman feels his mother is just sick of him and Norma just wants him to get caught so she can run off with Romero. Norma begins to scream saying she is Norma Bates and she faked her suicide but she wants out. Norman freaks out and strangles her again. He calls for her after he believes he killed her and she comes right back from the dead. She wants to know why Norman is so annoyed with her and why is he so angry? She tells him to never do that to him again and they walk home together. Norman wakes up to Madeleine calling him from the hardware store. She thanks him for the dresses, they fir perfectly and she loves them. She claims to feel his mother’s vibe and great taste from them. She invites him over for dinner, since her husband, Sam (Austin Nichols) is out of town again; he agrees to see her at 7. Norman heads over to visit Chick in his trailer inside the junkyard. Chick reveals he is writing a suspense novel, thinking the right hands when its completed could make quite a good little movie. Chick asks Norman what he wants, he wants him to hot wire a car and get rid of it. Chick asks him what he did, but when Norman won’t tell him; Chick tells him of a guy he knows, but he needs to know what he did. He says Norma is out of control, she doesn’t know what is best with everything, just like with Caleb. He says there is something very, very wrong with her. He doesn’t know how to reign her in; Chick offers to help with her. Norman tearful thanks him for being a good friend and for helping him with everything. Back at the Bates home, Norman comes down the stairs to his mother reading a book. He shares that he is going to Madeleine’s for dinner; and he isn’t interested whether she thinks its a good idea or not. She says he is going to do what he is going to do and she is going to do what she is going to do. He makes her promise she will do nothing in regards to her; but she says she will always do what is best for him and to protect him. He says he needs no protection from her; that he is going to have dinner with Madeleine and he is going to take care of the car and she needs to accept that he is in charge of his own life now, despite their arrangement. Norman arrives at Madeleine’s house and she is wearing his mother’s favorite dress; she offers to change but he says she looks wonderful and to keep it on. They share a great dinner together. Norman asks about Sam, and learns he is supposedly almost done his project in Seattle but she hasn’t had a chance to talk to him how she was feeling. They talk about how to know what is real unless it is right in front of you and you’re experiencing it. He encourages her to have that little talk with Sam. Out of the blue she asks if he wants to make a cake and together they can watch a movie and eat cake. He says he would love to. In the darkness, you hear a dog barking, a woman comes out with a baseball bat and discovers Romero. He asks Maggie if he can come in, she helps him inside. Meanwhile Madeleine bakes a cake while Norman watches her, until she pushes him to help her; its clear the tension is high. She says its ready to go in the oven but they end up beginning to make out; Norman sees his mother standing behind her, grabbing a knife and slashing Madeleine across the throat and dying on her floor. Norman realizes it didn’t happen and it was a vision, he races home, runs into the house and calls out for his mother, demanding to talk to her.